Paper Trading - What Does It Mean? What is paper trading? 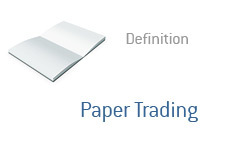 What is the definition of paper trading? What does the term "paper trading" mean? Paper trading is when trades are simulated instead of actually being executed. Paper trading is when you make imaginary trades without any real money being on the line. Paper trading is a great way to test out a new trading idea or theory without actually risking any real money on the transaction. Example: You have identified what you think is a profitable trading pattern for companies who have just reported their earnings. Instead of just diving in headfirst and committing actual capital to testing out the strategy (and potentially losing some or all of your money), you can instead choose to "paper trade" the strategy until you are comfortable that it will actually work. This can be as simple as simply writing down your trades on paper, or are complicated as having a computer program generate simulated trades and results. Paper trading is certainly recommended for people who are just starting out in the world of trading, and also for people who are testing out new ideas and strategies. It's important though, when paper trading, to accurately note when you would have bought and sold a stock. It's easy to fudge information (see curve fitting) to make your new theory or system look more successful than it actually is. Paper trading is very useful, but only if you are doing so with an objective eye.